Passive Fire Protection Materials Market size was more than USD 13 billion in 2016 and will witness 8.7% growth during the forecast span. Rising emphasis by the government to install advanced fire proof materials in the residential & commercial buildings, mainly in Asia Pacific is likely to boost the global passive fire protection materials market size over the forecast timeframe. Additionally, growing population which has led to rapid industrialization & urbanization in the region along with persistent need to improve fire safety standards in commercial & residential sector will help attain promising gains to passive fire protection materials market size in the coming years. For instance, building & construction industry in the region is projected to rise at a CAGR of over 7% which in turn will have positive impact on the overall passive fire protection materials industry size by 2024. These materials are an integral part of structural protection which helps in slowing down heat spread & smoke and subsequently results in delaying the damage and improving the fire escape duration. Additionally, rising awareness about fire safety along with technological advancements which is credited to rising R&D investment across various end-user industries including oil & gas, construction, etc. is likely to make noteworthy contribution to the global market in the coming years. Volatile raw material prices primarily for intumescent coatings is likely to obstruct the overall passive fire protection materials industry in the coming years. However, rising demand for advanced fire protective materials in emerging economies due to stringent legislations formulated by government agencies such as LEED to help protect human health & environment will generate plentiful opportunities for market in the coming years. Intumescent coatings passive fire protection materials market size is expected to witness gains close to 8.5% during the forecast timespan. It is water or epoxy based coating which can expand upon exposure to heat by almost 25 times in volume which results in forming a high strength and insulative fire resistance char. It acts as an excellent fire-resistant material across various end-user industries including construction, oil & gas, manufacturing, automotive, aerospace, warehousing, etc. which will make noteworthy contribution to passive fire protection materials industry size in the coming years. These materials are widely used for wood and steel structural protection and are more preferable across aforementioned industries due to its simpler installation and cost-effective nature compared to traditional protective coatings against fire which will have positive impact on the overall market size in the coming years. Passive fire protection materials market size for transportation industry is anticipated to witness gains at a CAGR close to 8% in the coming years. These materials are widely used in automobiles to avoid damage due to collisions which may be costly in terms of repair. They are used across fuel tanks, fluid shut-off devices, etc. which is intended to reduce the fuel leakage risk after collision. Rapidly growing automotive demand mainly in Asia Pacific is attributed to growing population and improving socio-economic factors will subsequently drive passive fire protective materials market size in the coming years. For instance, as per OICA, China sold over 1.8 million vehicles (commercial as well as passenger cars) in 2010 which rose to 2.8 million in 2016. Rising sales trends in automotive industry in the region along with improving safety standards are likely to make prominent gains to market size in the coming years. Asia Pacific passive fire protection materials market size is anticipated to witness CAGR close to 9.5% during the forecast timespan. This is mainly due to consistent efforts by government and regulatory bodies in the region to improve safety standards in commercial and residential buildings. Additionally, rapidly growing population in the region has led to industrialization & urbanization which has subsequently given rise to building & construction industry in the region. Furthermore, development of shale reserves in China is likely to drive oil & gas exploration activities which will boost end-users for fire protective coatings, sealants, etc. to avoid fatal accidents which may cause in the presence of highly flammable compounds. 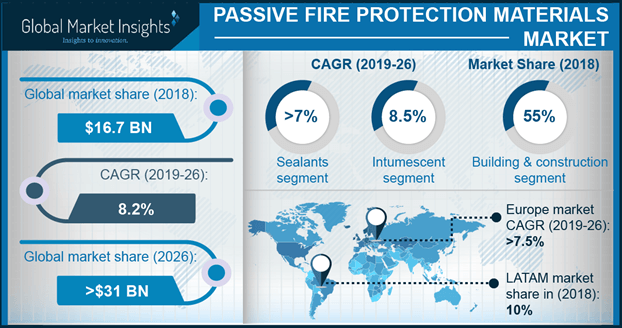 These trends are likely to make substantial contribution to passive fire protective materials market size in the coming years. Some of the prominent passive fire protection materials market players are Lloyd Insulations Ltd., Nullifire, Sharpfibre, 3M, Hempel, Sherwin-Williams, Rudolf Hensel GmbH, HILTI, Carboline, Akzo Nobel, PPG Industries, Teknos Group, Kansai Paint, Jotun and Promat International. Most of these players are actively engaged in forming strategic alliances to expand their business. For instance, AkzoNobel signed an agreement with Benarx Solutions in April 2017, a Norwegian-based manufacturer of advanced insulation materials to expand its fire protection in oil & gas industry. Passive fire protection materials are in-built into the structures which are intended to slow down or prevent fire spread at faster pace. These materials are widely preferred over conventional fire proofing materials owing to their easy installation and cost-effective nature. Rising R&D activities has led to development of these advanced fire proof materials which are widely used across several end-user industries including construction, oil & gas, manufacturing, transportation, warehousing, etc. to avoid fatal accidents which may be caused due to fire in the risk prone environment. 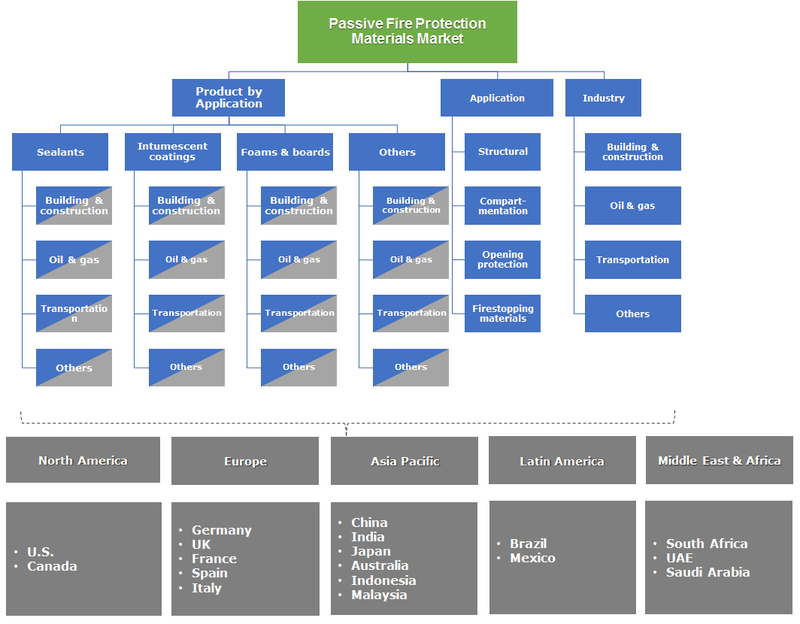 Strong growth in construction and automotive industry in the emerging economies, mainly Asia Pacific and MEA is likely to make significant contribution to passive fire protection materials industry size in the near future. In addition, rapidly rising exploration activities in the U.S. will propel oil & gas industry growth which will have positive impact on the business size by 2024. Moreover, stringent legislations formulated by regulatory bodies and government will propel demand for advanced fireproof coatings which will further drive market size by 2024.